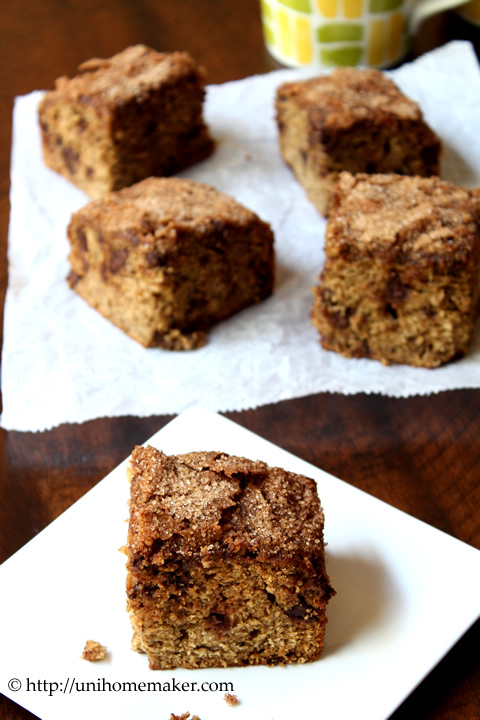 I came across Laurie’s recipe for a Banana Snack Cake over at A Taste of Morning. I knew I wanted to make this cake the second I had overly brown bananas. I’m always looking for new ways to bake with bananas and I have to say, I think this maybe a new favorite! I had baked some banana cinnamon muffins a while back before I started this blog. Have you ever had banana and cinnamon together? They’re a fantastic combination! Who knew? And banana and chocolate is a fabulous combination, why not throw cinnamon into the mix? The best part is the cinnamon sugar topping! And you can see it too. It has a lovely crunchy texture combined with the soft cake. I know I’ll be baking more of these tasty cakes sooner than later. Happy Thursday! Using a stand or electric mixer (or mix by hand) mix together flour, ground cinnamon, baking soda, baking powder and salt; set aside. In a medium bowl whisk mashed bananas, eggs, vanilla extract, canola oil, sugars and buttermilk until well combined. Slowly pour the banana mixture into the flour mixture and mix until just moistened. Then fold in chocolate chips. For the topping: In a small bowl combine granulated sugar and ground cinnamon. Mix the two with your fingertips and set aside. Pour batter into the prepared pan. Level batter using the back of a spatula then sprinkle cinnamon sugar on top. Bake for 40-45 minutes or until toothpick/tester inserted into the center comes out clean. Let the cake cool completely before cutting into the pan. Great recipe! I will make this to use up some of the many over ripe bananas in my freezer. I love the cinnamon sugar topping too! WOW! This looks great! I love banana and cinnamon together 🙂 Def going to have to try this! This looks wonderful. I love that it is called “snack cake” makes me want some even more. Good timing too because just last night I discovered a few brown bananas in the fruit bowl! I have two overripe bananas sitting in my counter, so I’m definitely halving the recipe and trying it soon! The cinnamon + banana combo sounds awesome, and the addition of chocolate is always a winner! Love it 😀 And have a nice day!! 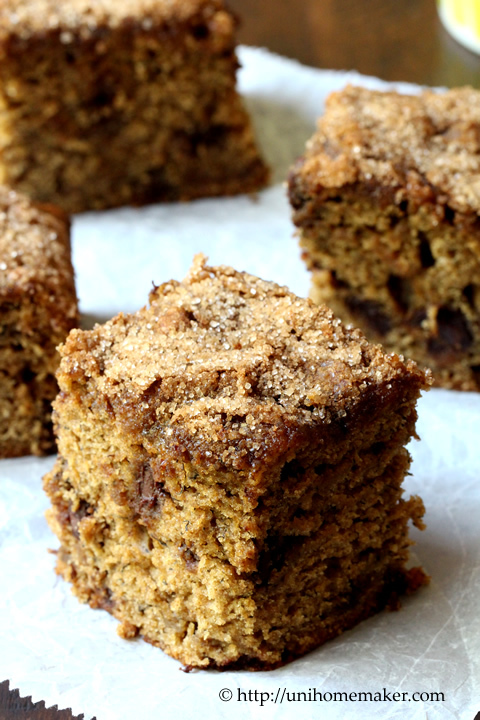 If only I had some brown bananas lying around right now…this snack cake looks amazing! I seem to always have “brown” bananas – love this recipe !!! And you gave me an idea – I think I’m gonna post a few recipes for “snackin’ cake” today. All the ingredients are mixed right in a 8″ x 8″ pan ! And one recipe, with a few changes, makes several versions. Thanks for giving me inspiration. “Pinning” this immediately !!! Yup! That was my favorite part…the cake itself was soft and moist, but the sugary topping added some texture and made it FUN! I have a feeling my kids would love this banana cake. I love cinnamon and banana together. Ain’t banana a magic fruit? I LOVE the recipe, Anne. You keep tempting with these delicious recipes… I’m in love with this cake! This might turn out to be a favorite cake with me too! Cinnamon is amazing. Period. I used to think I didn’t like cinnamon as a rule until I started baking a few years ago and loved the taste of some cinnamon and nutmeg in a batch of banana muffins. Now I realize it’s about balance and combinations. This looks delicious and I love how you use dark sugar in some of your baked goods. And chocolate chips in banana bread is so goood! Oh yeah, I could see that banana and cinnamon would be just yummy together. Beautiful cake Anne! Happy Thursday to you too! 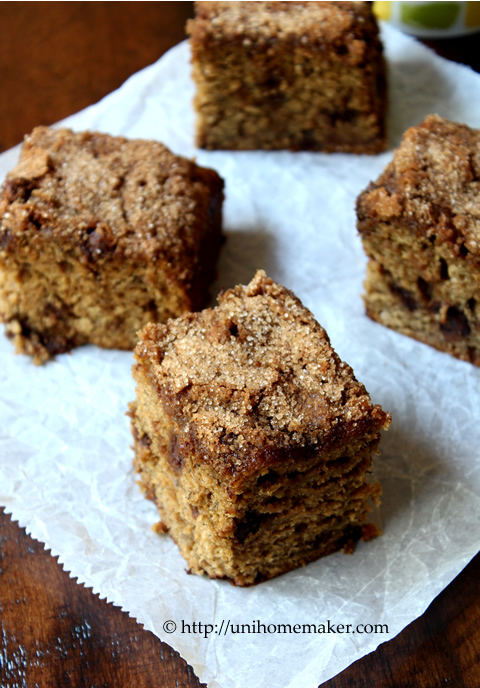 I really don’t know that I’ve ever had banana and cinnamon together….time to change that and make this! Happy Thursday! I love all of the ingredients in this! This cake looks great, and I would probably eat it for breakfast or dessert as well as a snack. Looks delicious, Anne! Your pictures turned out beautifully! Thank you for featuring the recipe. I am so glad that you like it. Looks incredible!!! I can see how moist it is – I want a piece right now! These look fantastic, Anne! Love the combination of banana & chocolate. Using cinnamon sugar is a reminder of my youth. Mom sprinkled it atop buttered toast for a treat on Saturday mornings occasionally. It was a favorite then and still is today. Not such a fan of cinnamon myself but I LOVE bananas and chocolate and that crunchy topping looks to die for. Great recipe Anne. I too am a banana and chocolate combo person, adding cinnamon to the mix kicks it up a notch. So Anne, I am sitting here with my coffee and would love a piece of this bread! Looks great – pinning for future! 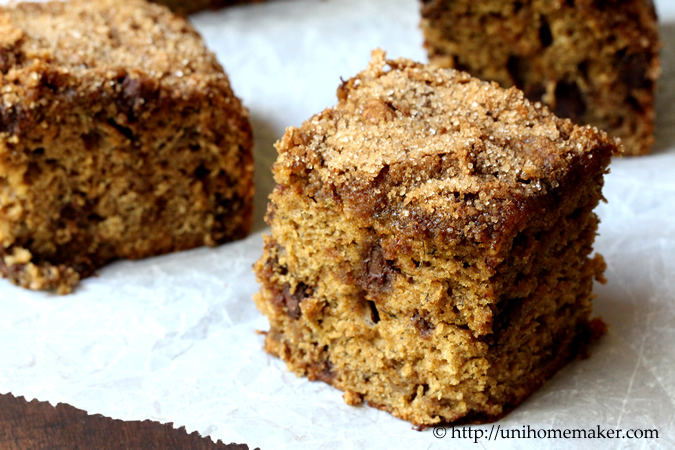 I’m such a fan of snack cakes : ) And I definitely love all the cinnamon in here! I love cinnamon all the time … but something about it during the fall …. just so good! 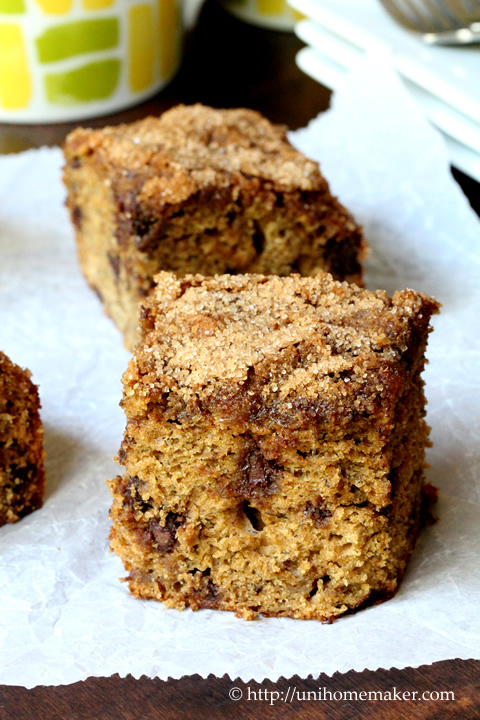 I love the combination of banana and chocolate, and in this delicious snack cake I bet it tastes amazing! What a lovely treat, Anne. Thanks for sharing! This combination adds up to a no-fail idea! I have always loved a little banana with my chocolate, or some derivation thereof of. This recipe is just that and even more! Great post, thanks for sharing!! Looks delicious Anne! We always have overripe bananas laying around! I am such a cinnamon lover it’s unbelievable! Yet….I’m not sure that I’ve ever paired it with banana. Doh! Great idea! I’m head over heels for this cake! The cinnamon plus banana plus chocolate sounds like heaven and it certainly looks like heaven. This is one of the best ways I’ve seen banana cake done, hands down! so beautiful! reminds me of a no-fat one I once made from orangette – but I’m naturally predisposed to anything with chocolate chips! What a delectable trio of flavors! I wish I was snacking on a square or two right now! It looks heavenly! YUM! This is perfect for a snack or breakfast! I love it, Anne! Pinning this. Hope you have a wonderful week! This snack cake must be as heavenly to smell as it is to eat!! Do you think cinnamon is addictive? I am definitely either addicted or in love with the stuff! 🙂 My favorite is Chinese cinnamon but I like trying different varieties to see how they effect a recipe. ( I know you too are a cinnamon lover, Anne. Have you seen the descriptions and varieties at thespicehouse.com ?) I am impatiently waiting for my bananas to brown so that I can give this a try! I LOVE cinnamon and yes, it is so addictive! 🙂 I have not tried Chinese cinnamon but I’ll be on the lookout for them. Never heard of the spice house but I will check them out. Thanks for stopping by Wendy! I’m not sure why yours look a bit cracked. I’m assuming the sugar topping looks raw on top because you took it out of your oven too early. I’m assuming “I took it out of my oven a few minutes back” means you took it out early. Without looking at your cake, there’s not much feedback I can give you. You’re right about the sugar topping, it was a bit raw as in, the cinnamon sugar crystals remained uncooked. I took the cake out at 40min as it was already baked and left no crumbs when I did the toothpick test. But the cake tasted really good; my family liked a lot. But me being a perfectionist, I was a bit concerned about the topping. If there is a way for me to send you a pic of my cake, I would be glad to do so!